Retirement is a series of irrevocable decisions, make sure that you have a Retirement Income Road Map from Anthony Capital, LLC to help guide you through the process. What exactly is a Retirement Road Map? a map, especially one designed for retirees, showing the income sources that they will have in retirement. a plan or strategy intended to achieve a particular goal, for example–making sure that you have enough money to live on in retirement. From were and from which accounts your income will come from in retirement. 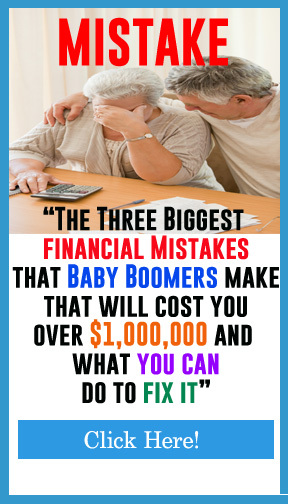 When you combine the “Eight Essential Financial Decisions” that every affluent baby boomer must make to secure a successful retirement, you have a comprehensive, integrated, and rock-solid retirement income plan that can save today’s affluent baby boomer retirees hundreds of thousands of dollars in unnecessary fees, expenses, taxes, and penalties throughout their retirement lives. To request your Retirement Income Road Map, contact us to get on our calendar! Set up your complimentary review meeting today! Even if we are in a new Secular Bull Market, market history says future returns are likely to be modest at best. The CAPE is at 28.88, down from the prior week’s 29.30, and now exceeds the level reached at the pre-crash high in October, 2007. Since 1881, the average annual return for all ten year periods that began with a CAPE around this level have been just 3%/yr (see Fig. 2). The “big picture” is the months-to-years timeframe – the timeframe in which Cyclical Bulls and Bears operate. The U.S. Bull-Bear Indicator (see Fig. 3) is in Cyclical Bull territory at 69.81 down from the prior week’s 73.17. The Shorter-term (weeks to months) Indicator (see Fig. 4) turned negative on March 24th. The indicator ended the week at 25, down from the prior week’s 28. Separately, the Intermediate-term Quarterly Trend Indicator – based on domestic and international stock trend status at the start of each quarter – was positive entering January, indicating positive prospects for equities in the first quarter of 2017. In the Secular (years to decades) timeframe (Figs. 1 & 2), whether we are in a new Secular Bull or still in the Secular Bear, the long-term valuation of the market is simply too high to sustain rip-roaring multi-year returns. The Bull-Bear Indicator (months to years) is positive (Fig. 3), indicating a potential uptrend in the longer timeframe. In the intermediate timeframe, the Quarterly Trend Indicator (months to quarters) is positive for Q1, and the shorter (weeks to months) timeframe (Fig. 4) is negative. Therefore, with two of three indicators positive, the U.S. equity markets are rated as Neutral. U.S. markets: Tuesday marked the first time in 109 days that the S&P 500 index closed down 1% or more. Markets were weighed down by a multitude of concerns, including the attempted passage of a new healthcare law, the pace of central bank rate increases, rising inflation, and North Korea’s nuclear saber rattling. For the week, the Dow Jones Industrial Average tumbled 317 points to close at 20,596, a loss of -1.5%. The tech-heavy Nasdaq Composite fell -1.2% to close at 5,828. By market cap, the large cap S&P 500 index retreated -1.4%, while the S&P 400 mid cap index and small cap Russell 2000 index fell -2.1% and -2.6%, respectively. International markets: Canada’s TSX fell a third of a percent, its third consecutive weekly loss. In Europe, major markets were red across the board, but with relatively minor declines. The United Kingdom’s FTSE retreated ‑1.2%, while on Europe’s mainland France’s CAC 40 fell -0.17% and Germany’s DAX lost a quarter of a percent. In Asia, major markets were mixed. China’s Shanghai Composite Index rose almost 1% while Japan’s Nikkei slumped ‑1.3%. Hong Kong’s Hang Seng rose a slight 0.2%. As grouped by Morgan Stanley Capital International, developed markets were essentially flat falling a modest -0.14%, while emerging markets rose 0.8%. Commodities: Precious metals continued to be bid higher. Gold rose for a second consecutive week, gaining 1.5%, to $1,248.50 an ounce. Similarly, Silver tacked on 1.9% ending the week at $17.75 an ounce. Oil gave up last week’s tepid gain falling a steep -2.7% to $47.97 a barrel for West Texas Intermediate crude. Finally, copper, viewed by some as an indicator of global economic health, retreated -2.25%. U.S. Economic news: The number of Americans who applied for new unemployment benefits last week rose by 15,000 to 258,000. The number exceeded analyst expectations for a slight decline to 240,000. The four-week average of initial claims, smoothed to reduce the weekly volatility, rose by 1,000 to 240,000. New claims have remained below the key 300,000-level that analysts use to signify a healthy labor market for 80 straight weeks. Sales of newly constructed homes surged to a seven month high last month as robust demand overcame lean supply, higher prices, and slightly higher mortgage rates. The Commerce Department reported new-home sales ran at a seasonally-adjusted 592,000 annual rate, up 6.1% from January and an increase of 12.8% over last February’s rate. The median sales price was $296,200, a decline of 3.9% from January, and a fall of 4.9% from the same time last year. Lower prices are likely helping to boost sales. At the current sales pace, there is a 5.4 month supply of homes available on the market. Sales of previously owned homes fell last month as home inventory remained tight. The National Association of Realtors (NAR) reported last month’s sales were down 3.7% from January’s pace to a 5.48 million seasonally-adjusted annual rate. Economists had forecast a 5.45 million annualized pace. Still, sales were 5.4% higher than the same time last year. The median home price rose 7.7% from a year ago to $228,400. At the current sales rate, it would take only 3.8 months to deplete the available supply of homes. By region, sales rose in only one region, the South, where they were up 1.3%. Declines were the steepest in the Northeast where they dropped a sharp 13.8%. In the west, sales fell 3.1%, while in the Midwest sales were down 7.0%. According to NAR Chief Economist Lawrence Yun, properties were on the market a median 45 days, down from 59 days a year ago. The Chicago Fed’s national activity index rose 0.36 point to 0.34 in February, beating expectations of only a 0.05 point rise. In the report, employment-related indicators led the way contributing 0.21 to the overall gain. The number of people reported as employed increased sharply last month. Production-related indicators added 0.09 point supported by a second consecutive 0.5% increase in manufacturing production. Overall, a surge of 444,000 employed people in the February household employment report was responsible for most of the indicator’s gain. International economic news: Canada’s central bank released a report that the Canadian economy was progressing but “risks remain”. Lawrence Schembri, deputy governor of the Bank of Canada said that the Canadian economy has made good progress since the plunge in oil prices in 2014, but slack and risks remain. In a prepared text to the Greater Vancouver Board of Trade, Mr. Schembri said, “uncertainty remains elevated because of prospective policies that put at risk the progress made in recent decades to liberalize trade and foster economic integration.” Schembri said that Canada has so far resisted the protectionist “tilt” that the new U.S. administration is intent on, noting the recent free trade agreement with Europe. The Bank of Canada’s key interest rate has been fixed at 0.5% since July 2015 and there is no expectation that it will be hiked anytime soon. Across the Atlantic, Britain’s decision to leave the European Union may have unintended consequences that could impact the entire United Kingdom. The Scottish National Party (SNP) is now pushing for Scottish independence from the UK to ensure their prosperity and avoid any damage that may be caused by the Kingdom leaving the EU. Niall Mclean, who sits on the advisory board of Business for Scotland, a pro-independence group, stated, “Independence gives us a route where the EU market is still open to us and there is a way forward for trade. Brexit is the opposite.” Scotland’s First Minister and SNP leader Nicola Sturgeon says Brexit has dissolved the certainty that the United Kingdom once offered. Faced with being taken out of the EU against the will of the (Scottish) majority, Scots must have a new choice, she argued. “Independence offers them an opportunity to stay in the (EU) bloc, or at least its single market, after Britain exits”, she stated. In France, the Presidential election has become a battle between two very different economic visions that will have profound implications for all of Europe. The leading candidates are Marine Le Pen of the far-right National Front party, and Emmanuel Macron of the progressive social liberal En Marche! Party. Le Pen wants France to quit the Euro in favor of a “nouveau franc” and protect French jobs. Macron favors open borders and more European integration. Le Pen argued that French companies should be given priority when bidding on public contracts. “The state must give priority to French companies and not foreign companies,” she said. “I’m not here to create jobs for our neighbors.” France’s presidential election will be held on April 23, 2017. Should no candidate win a majority, a run-off election will be held May 7. The Germany economy is on a roll. Businesses in Europe’s largest economy have achieved their highest rate of growth in over 6 years, according to research firm IHS Markit. This month marked another month of robust growth in Markit’s purchasing manager’s survey for Germany where the index accelerated from 56.1 to 57 (readings above 50 mark growth). The German economy has been notably strong over the last 12 months, driven by falling unemployment, low inflation, and record monetary stimulus from the European Central Bank. Of concern, however, is the level of German inflation which has also been climbing since the start of the year. Inflation hit 2.1% last month, a four-year high, that is expected to weigh on consumer spending going forward. In Asia, one of China’s most widely used interbank borrowing rates surged to its highest level in over 2 years last week, spreading fears that the country could experience a shortage of short-term credit, a condition known as a “credit crunch”. China’s seven-day repurchase rate (known as a “repo rate”) vaulted almost 2% to 5.5% earlier this week before settling at 5% on Wednesday. Analysts state the sudden jump is not necessarily unexpected given that China’s parliament recently concluded that they would make addressing the nation’s rising debt a priority. In addition, the country’s central bank has embarked on a tightening cycle, raising its short-term policy rates for the third time in three months last week. The Japanese manufacturing sector continued to expand at a slow but steady pace this month, according to research firm Markit’s Japan Flash Manufacturing Purchasing Managers Index (PMI). Japan’s PMI came in at 52.6 this month, slightly below the estimate of 53.5, but remaining in growth mode above 50. March was the seventh consecutive month of manufacturing activity expansion. Amy Brownbill, economist at IHS Markit said “Although signaling a slower rate of expansion during March, the latest PMI data again point to a Japanese manufacturing economy expanding at a decent clip.” Output, new orders, and new export orders all increased but at a slower rate. The Bank of Japan expects fiscal 2017 growth to be 1.5%. Finally: As the market experienced its worst week of the year, participants have begun to wonder if the so-called “Trump Trade” could be over. A number of analysts are particularly concerned because they’ve noted that small cap stocks have not kept pace with their larger brethren in the first quarter, after strongly outperforming in 2016. According to a well-known market adage, a market is deemed healthy if the troops (small caps) are rising in tandem with the generals (large caps) – and is unhealthy if there is a significant divergence between them. Market researcher Mark Hulbert decided to put the adage to the test and his results were surprising. As shown on the following chart, it turns out that the S&P 500 actually has had (on average) the best future 3-month performance when large caps have outperformed small caps by more than 5% in the trailing 3-months. So, that old generals and soldiers analogy does not hold up to at least this one statistical test. Even if we are in a new Secular Bull Market, market history says future returns are likely to be modest at best. The CAPE is at 29.30, little changed from the prior week’s 29.23, and now exceeds the level reached at the pre-crash high in October, 2007. Since 1881, the average annual return for all ten year periods that began with a CAPE around this level have been just 3%/yr (see Fig. 2). The “big picture” is the months-to-years timeframe – the timeframe in which Cyclical Bulls and Bears operate. The U.S. Bull-Bear Indicator (see Fig. 3) is in Cyclical Bull territory at 73.17 little changed from the prior week’s 73.04. The Shorter-term (weeks to months) Indicator (see Fig. 4) turned positive on November 10th. The indicator ended the week at 28, down from the prior week’s 30. Separately, the Intermediate-term Quarterly Trend Indicator – based on domestic and international stock trend status at the start of each quarter – was positive entering January, indicating positive prospects for equities in the first quarter of 2017. In the Secular (years to decades) timeframe (Figs. 1 & 2), whether we are in a new Secular Bull or still in the Secular Bear, the long-term valuation of the market is simply too high to sustain rip-roaring multi-year returns. The Bull-Bear Indicator (months to years) is positive (Fig. 3), indicating a potential uptrend in the longer timeframe. In the intermediate timeframe, the Quarterly Trend Indicator (months to quarters) is positive for Q1, and the shorter (weeks to months) timeframe (Fig. 4) is positive. Therefore, with all three indicators positive, the U.S. equity markets are rated as Positive. Most major U.S. and global stock markets ended the week on an upbeat note following this week’s rate hike and mostly-dovish comments from the Federal Reserve. The Dow Jones Industrial Average tacked on 11 points to close at 20,914. The tech-heavy Nasdaq Composite rose 0.67% to end the week at 5,901. By market cap, smaller caps rebounded and outperformed large caps. The S&P 500 large cap index gained 0.24%, while the mid cap S&P 400 and small cap Russell 2000 added 1.18% and 1.92%, respectively. In international markets, Canada’s TSX retreated a slight -0.1%. Across the Atlantic, the United Kingdom’s FTSE gained 1.12%. On Europe’s mainland France’s CAC 40 gained 0.72%, along with Germany’s DAX which rose 1.1%. Italy’s Milan FTSE was up over 2.1% as concerns over the stability of the nation’s banking system continued to fade. In Asia, major markets were mixed. China’s Shanghai Composite gained 0.77%, while Japan’s Nikkei fell ‑0.42%. Hong Kong’s Hang Seng surged 3.15%. As grouped by Morgan Stanley Capital International, emerging markets as a group rose a very handsome 3.89%, while developed markets as a group gained a respectable but lesser 1.93%. Both developed and emerging markets are now in the “Above Average – best for new positions” group shown in the Asset Class Ranking table (Fig. 5). In commodities, the precious metals group was positive for the first week in three. Gold rebounded 2.4%, to end the week at $1,230.20 an ounce. Silver was up a similar 2.9%, closing at $17.41 an ounce. Oil rebounded slightly from last week’s slump by rising 1.69% to $49.31 a barrel for West Texas Intermediate crude oil. The industrial metal copper, seen by some as an indicator of world economic health, gained 3.72% last week. In U.S. economic news, the number of Americans who applied for new unemployment benefits fell by 2,000 to 241,000 last week, essentially matching economists’ expectations for 240,000. Initial jobless claims have remained below the key 300,000 threshold that analysts use to indicate a healthy job market for 106 consecutive weeks, the second-longest streak since the mid-1960’s. Construction of new houses in the U.S. climbed 3% to a seasonally-adjusted annualized rate of 1.29 million units last month – its second-highest level since 2007. The increase beat expectations of 1.26 million units and is an indication of the continuing demand for new housing amid a steadily growing economy. According to the Commerce Department, single-family starts were up in the West, Northeast, and Midwest, but fell in the South. In addition, single-family home building jumped 6.5% to a pace of 872,000 units last month, while multi-family housing units such as apartments fell 3.7% to 416,000 units. Optimism among small-business owners slipped last month, but remained near long-term highs as owners remained hopeful that the new president will bring more business-friendly policies. The National Federation of Independent Business’ (NFIB) small business index fell 0.6 point to 105.3, better than the 0.9 point drop expected by economists. The stronger economy’s tight labor market continued to hit small businesses particularly hard. In its release, the NFIB wrote “This is one of the tightest labor markets in the 43-year history of the NFIB survey.” Nearly one-third of respondents reported having unfilled job openings and 17% reported “finding qualified labor” was their single most important problem—its highest level in eight years. Most Americans remain optimistic that the U.S. economy will continue to grow, according to the latest University of Michigan Consumer Sentiment index. However a sharp divide remained based on the party affiliation of the respondent. The index of consumer sentiment rose 1.3 points to 97.6 for March. Economists had forecast a reading of 98. Among Republicans, the March survey showed economic expectations climbing to 122.4, a level that typically signals a “new era of robust economic growth”. However, among Democrats the survey slumped to 55.3, a number that has usually signaled “that a deep recession or depression is imminent.” As expected, sentiment among swing voters was roughly in the middle at 88.3. Looking at the present, the index of current conditions rose 3 points to 114.5, its highest level since 2000. Most respondents said their own finances were in “very good shape”. U.S. retailers reported weak sales last month, despite the unseasonably warm weather, according to the Commerce Department. Sales at retailers nationwide were up a slight 0.1% last month, still an increase but a sharp slowdown from the prior two months’ gains. The results for last month were dragged down by a 0.2% drop in auto sales. Auto purchases account for about 20% of total retail spending. Gasoline stations also recorded a 0.6% decline in sales, but perversely that’s viewed as a positive because it’s beneficial to American households. Ex-auto and gas, retail sales were up a 0.2% pace. Leading the gains were home-and garden centers, internet retailers, and health and beauty stores. Among the laggards were department stores, along with electronic, appliance, clothing, and sporting goods stores. American consumers paid slightly more for goods and services last month according to the Bureau of Labor Statistics. The Consumer Price Index rose 0.1% in February, meeting analysts’ expectations. Consumer prices have risen 2.7% over the past year. Excluding the volatile food and energy categories, the so-called “core” prices increased 0.2%, up 2.2% over the past year. Both measures have now exceeded the Federal Reserve’s stated goal of a 2% rate of inflation, with several key categories now exceeding that target range. Housing costs are now up 3.5% over the past year, while the cost of medical treatment has climbed 3.4%. Prices of wholesale goods continued to rise last month, up 0.3% as the cost of services such as financial advice, legal help, and travel increased. The latest Producer Price Index reading pushed wholesale prices up 2.2% over the last year, its highest rate since the spring of 2012. Stripping out the volatile food, energy, and retail margin categories yields the more stable core PPI index. That index, which is of more interest to analysts, also increased 0.3%. Wholesale costs have been steadily rising since last summer, predominantly due to the rebound in energy prices, while the cost of other commodities and raw materials have continued to climb as well. The move higher in wholesale prices has been confirmed by other measures of inflation such as the consumer price index and the personal consumption expenditures index. This week, the Federal Reserve lifted its key short-term interest rate for the second time in three months, but remained steadfast in its forecast calling for just two more rate hikes this year. Steady U.S. growth, an improving labor market, and greater confidence among consumers and businesses gave the central bank the justification for its quarter point Fed funds rate increase. In announcing the rate hike, Fed Chairwoman Janet Yellen said in a press conference, “The simple message is: the economy is doing well.” The Fed also noted that the recent uptick in prices has resulted in inflation moving close to its 2% target, which was another critical component in its decision. Notes show the vote was 9-1 in favor of a hike, with only the Minneapolis Fed president preferring to leave rates unchanged. In Canada, Alberta Finance Minister Joe Ceci outlined a budget for the oil-rich Alberta region stating a pipeline to the Canadian coast would be the “best way” to sell its energy resources. Alberta is at the center of Canada’s rich oil and natural gas energy sector. In releasing its budget plans through 2020, the provincial government said the dual headwinds of low oil prices and devastating wildfires last year meant that the economy is just now starting to recover. The government estimates that the provincial economy will grow by 2.6% this year. Mr. Ceci said that while drilling is on the rise and oil prices recover, the provincial economy is not yet “out of the woods”. While new President Donald Trump supports the Keystone XL oil pipeline, Ceci focused his budget speech on breaking its landlock for the sake of diversity. “Getting a Canadian pipeline built to a Canadian coast is the best way for our world-class energy producers to sell our resources at world-class prices,” he said. In Germany, Economy Minister Brigitte Zypries said the EU could sue the US at the World Trade Organization if the U.S. imposes its planned border tax. The comments came as German Chancellor Angela Merkel planned to meet with President Donald Trump this week. Republicans in Congress are pushing for a “border adjustment” that would impose a 35% tax on cars that Germany exports to the United States. Economy Minister Zypries said that Germany had two possible responses: either adjusting the global tax system to make it conform with such a border tax, or filing suit against the US at the World Trade Organization. She also said the US would be “shooting itself in the foot” if it did proceed with high import duties “because they need our machines and plants”. In Asia, China’s Premier Li Keqiang reassured investors that the world’s second-largest economy is strong and not at risk of a “hard landing”, while stressing the government’s support for globalization and free trade at a time of rising protectionism. Li also repeated earlier remarks that China does not want a trade war with the United States, and urged talks with the American government to find common ground. Li said at the annual meeting of China’s parliament “We do not want to see any trade war breaking out between the two countries. That would not make our trade fairer.” While the accuracy of the official government data has been questioned repeatedly, most analysts agree that economic activity did pick up last year supported by heavy government infrastructure spending and record bank lending. Even if we are in a new Secular Bull Market, market history says future returns are likely to be modest at best. The CAPE is at 29.23, little changed from the prior week’s 29.36, and now exceeds the level reached at the pre-crash high in October, 2007. Since 1881, the average annual return for all ten year periods that began with a CAPE around this level have been just 3%/yr (see Fig. 2). The “big picture” is the months-to-years timeframe – the timeframe in which Cyclical Bulls and Bears operate. The U.S. Bull-Bear Indicator (see Fig. 3) is in Cyclical Bull territory at 73.04 down from the prior week’s 74.28. The Shorter-term (weeks to months) Indicator (see Fig. 4) turned positive on November 10th. The indicator ended the week at 30, down from the prior week’s 33. Separately, the Intermediate-term Quarterly Trend Indicator – based on domestic and international stock trend status at the start of each quarter – was positive entering January, indicating positive prospects for equities in the first quarter of 2017. U.S. stocks moved modestly lower, with the Standard & Poor’s S&P 500 Index recording its first weekly loss since mid-January. As has been the theme recently, smaller cap indexes underperformed large caps, now for four consecutive weeks. The SmallCap Russell 2000 index is now down roughly -3.5% from its all-time peak it established in early March, undoing some of the dominance that SmallCaps exhibited throughout 2016. The Dow Jones Industrial Average retreated -102 points to end the week at 20,902, a loss of -0.49%. The tech-heavy Nasdaq Composite ended down a slight -0.15%, closing at 5,861. Market analysts noted that this week marked the eighth anniversary of the bull market that began in March, 2009. By market capitalization, the LargeCap S&P 500 fell -0.44%, while the MidCap S&P 400 retreated -1.6%, and the SmallCap Russell 2000 ended down over -2%. Canada’s TSX reversed last week’s gain, falling -0.65%. In Europe, the United Kingdom’s FTSE retreated from last week’s all-time high by falling -0.4%. On the European mainland, France’s CAC 40 and Italy’s Milan FTSE were essentially flat, while Germany’s DAX retreated half a percent. In Asia, China’s Shanghai Composite fell for a second week, down -0.2%, while Japan’s Nikkei rose for a third straight week, up +0.7%. As grouped by Morgan Stanley Capital International, developed markets were up a second week by +0.2%, while emerging markets fell a third consecutive week, losing half a percent. In commodities, precious metals were down for second week. Gold was off by -2%, or $25.10 to end the week at $1,201.40 an ounce. Silver, traditionally more volatile than gold, fell -4.6% to $16.92 an ounce. The industrial metal copper, viewed by some as an indicator of worldwide economic health, retreated -3.8%. Oil has been in a 3-month consolidation, but broke out to the downside this week, plunging -9% on heavy volume to close at $48.49 per barrel of West Texas Intermediate crude oil. The private sector recorded its third-best showing for jobs creation since the Great Recession according to data from payrolls processor ADP. ADP reported that 298,000 new private-sector jobs were added last month, the highest in nearly three years. The details of the report were also strong. Well-paying fields like construction, professional services, and business services each added 66,000 jobs, while education, health, and leisure and hospitality each added another 40,000. Importantly, manufacturing – which has lagged the economic recovery – added 32,000 jobs. New orders for U.S.-made goods climbed 1.2% in January, according to the Commerce Department. Factory orders have now increased 6 out of the last 7 months, and suggest the recovery in the manufacturing sector continues to gain momentum. Orders were up 5.5% from the same time last year. Manufacturing accounts for roughly 12% of the U.S. economy. The Federal Reserve reported that corporate debt grew by the slowest percentage in six years in the final quarter of last year. Analysts believe that companies are taking a more cautious stance as the Federal Reserve prepares to raise interest rates. Corporate debt grew at a seasonally adjusted annual rate of 0.8% in the last quarter of 2016. Cash levels remained roughly the same at $2.08 trillion. Overall, household and non-profit net worth rose $2.04 trillion to $92.8 trillion. Most of that gain came from stock market gains as corporate equities added $728 billion in market valuation. The increase in labor productivity among American firms and employees remained unchanged at 1.3% in the final quarter of last year, making 2016 the worst performing year since 2011. Output, which is the amount of goods and services produced, increased 0.2% to 2.4%. Productivity increases when output rises faster than hours recorded on the job. The most significant aspect of the latest report is the big increase in productivity among manufacturers. The government revised the gain up 1.3% to 2%. Rising productivity is the key to a more vibrant economy, as it allows companies to earn bigger profits and invest more while paying better salaries to workers. The U.S. trade deficit surged to a five-year high in January, rising 9.6% to $48.5 billion in January. The wider deficit was driven by a 2.3% increase in imports of oil, foreign-made cars, and consumer goods like mobile phones from China and other countries. The rising cost of oil also boosted the value of U.S. imports. U.S. exports rose a lesser 0.6% to $192.1 billion. Exports of cars and trucks, oil, and soybeans all rose sharply. Both imports and exports rose to their highest levels since December of 2014, evidence that global trade is picking up. A close aide to President Trump, economist Peter Navarro, argued in a major address this week that a high trade deficit poses large risks economically and undermines national security. In international news, the Paris-based thinktank Organization for Economic Cooperation and Development (OECD) reported Canada’s economy is expected to grow by 2.4% this year, matching the U.S. rate of growth. That’s an increase of 0.3% over the group’s last growth estimate. The group said Canada’s economy will be supported this year by export growth, a better market for commodities, and government spending initiatives. However, once again it was concerned with the rapid increase in Canadian home prices. “As past experience has shown, a rapid rise of house prices can be a precursor of an economic downturn,” it wrote. The OECD works with the governments of 35 member countries to collect data and analyze trends around the world. In addition, the OECD raised its forecast for the United Kingdom as well, its second upgrade in just four months. The OECD, which had previously (and very mistakenly) predicted a collapse of the UK’s economy if it voted to leave the EU, upgraded the UK’s growth forecast to 1.6%, up 0.4% from November’s estimate. Chancellor Philip Hammond of the United Kingdom remarked that the economy was performing “extremely well” in the wake of the Brexit vote. However, those that were expecting an increase in government spending in the Chancellor’s new budget will be disappointed. The Chancellor stated that the Treasury’s priority is “making sure that our economy is resilient, that we’ve got reserves in the tank”. In Asia, China plans to create 11 million new jobs for urban residents this year, despite the slowdown of economic growth. Chinese Prime Minister Li Keqiang delivered the government’s job creation goal at the opening meeting of the National People’s Congress and also promised to keep the registered urban unemployment rate at or below 4.5%. Zheng Gongcheng, professor with Renmin University of China said the medium-to-high speed growth and considerable economic aggregate provide the country the basis to stabilize and expand employment. Data showed that the service industry now accounts for 51.6% of China’s GDP and that the sector will continue to create more jobs. Finally, as the market takes a pause from its recent string of new highs, the question investors are pondering is whether it will it resume its march higher, or perhaps turn negative. 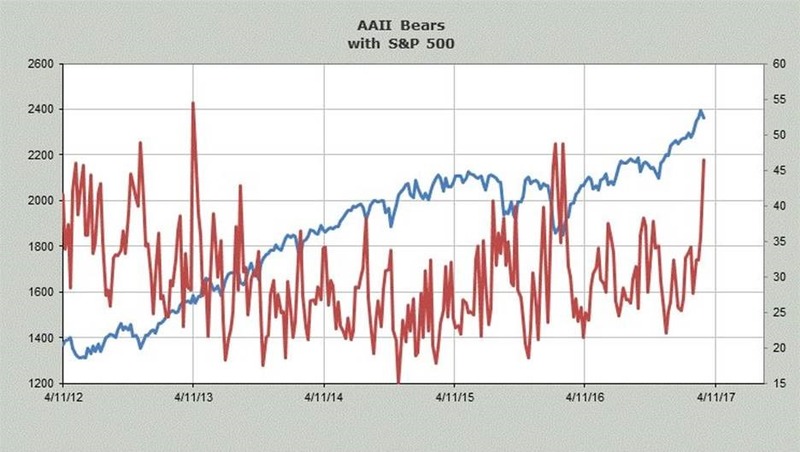 According to the American Association of Individual Investors, bearishness among regular folks has just climbed to its highest level in over a year and second-highest in four years. But before considering rotating into “safe haven” investments, investors might instead consider that analysts actually view this as a contrarian indicator. In other words, sophisticated professional investors actually are more optimistic the gloomier the regular folks get. According to financial blogger Jani Ziedins, “When the market isn’t doing what the crowd expects, that means it is getting ready to do the opposite.” While not ready to predict a move higher, Mr. Ziedins suggests that is “far more likely” than an imminent collapse. Even if we are in a new Secular Bull Market, market history says future returns are likely to be modest at best. The CAPE is at 29.36, little changed from the prior week’s 29.34, and now exceeds the level reached at the pre-crash high in October, 2007. Since 1881, the average annual return for all ten year periods that began with a CAPE around this level have been just 3%/yr (see Fig. 2). The “big picture” is the months-to-years timeframe – the timeframe in which Cyclical Bulls and Bears operate. The U.S. Bull-Bear Indicator (see Fig. 3) is in Cyclical Bull territory at 74.28 up from the prior week’s 72.17. The Shorter-term (weeks to months) Indicator (see Fig. 4) turned positive on November 10th. The indicator ended the week at 33, unchanged from the prior week. Separately, the Intermediate-term Quarterly Trend Indicator – based on domestic and international stock trend status at the start of each quarter – was positive entering January, indicating positive prospects for equities in the first quarter of 2017. The major U.S. indexes ended flat to modestly higher, mostly on the back of an impressive rally on Wednesday. The Dow Jones Industrial Average performed the best for the week, adding +183.95 points to close at 21,005. The technology-heavy NASDAQ Composite rose +0.44% to end the week at 5870. By market cap, large caps edged smaller caps. The LargeCap S&P 500 logged its fifth straight weekly gain, rising +0.67%, while the S&P 400 MidCap index added only +0.16%, and the SmallCap Russell 2000 trailed the others by ending the week down -0.03%. In international markets, Canada’s TSX rebounded from last week’s weakness by rising +0.48%. Across the Atlantic, the United Kingdom’s FTSE surged +1.8% to an all-time high. On Europe’s mainland, major markets logged a very positive week. France’s CAC 40 jumped +3.09%, Germany’s DAX gained +1.89%, and Italy’s Milan FTSE surged +5.74%. In Asia, China’s Shanghai Composite index slumped -1.08%, while Japan’s Nikkei was up +0.96%. As defined by Morgan Stanley Capital International, emerging markets as a group ended down -0.8%, while developed markets as a group rose +0.9%. In commodities, precious metals gave up their luster from the past few weeks. Gold fell for the first time in 5 weeks, falling -2.53% to $1,226.50 an ounce. Likewise, Silver gave up its gains of the last few weeks by falling ‑3.62% to $17.74 an ounce. The industrial metal copper remained essentially flat, rising just +0.02%. Oil continued trading in a narrow $52-$55 range, falling -1.22% to $53.33 a barrel for West Texas Intermediate crude oil. In U.S. economic news, the number of Americans who applied for unemployment benefits last week fell by 19,000 to just 223,000—a new post-recession low. The low number of jobless claims reflects the strength of the U.S. labor market. New claims have been under the key 300,000 threshold that analysts use to define a healthy job market for 104 straight weeks, according to the Labor Department. The less-volatile smoothed four-week average of initial claims dropped by -6,250 to 234,250. That number is at its lowest level since April of 1973. Companies continue to report difficulty finding skilled workers to hire. The National Association of Realtors (NAR) reported that its gauge of pending home sales fell in January as the market felt the weight of insufficient inventory and rising prices. The NAR’s index fell ‑2.8% to 106.4—its lowest level in a year. The index forecasts future sales by tracking real estate transactions in which a contract has been signed, but the deal has not yet closed. Housing markets were mixed by region. The Northeast and South saw gains of +2.3% and +0.4%, respectively, while in the Midwest and West, the index plunged ‑5% and ‑9.8%, respectively. Home prices surged higher in December. The S&P/Case-Shiller 20-city index rose +5.6% in the three-month period ending in December, compared to a year ago. The broader national index was up +5.8% for the year in December, the biggest increase in two and half years. In the S&P/Case-Shiller report, the hottest markets were once again in the West: Seattle, Portland, and Denver saw home price increases of +10.8%, +10%, and +8.9%, respectively. The national price index is now +0.5% higher than its previous peak in July 2006, while the 20-city index is still 6.7% lower. The Institute for Supply Management (ISM) reported its national manufacturing index rose +1.5% to 57.5 in January, to its highest reading since August 2014. According to the report, 17 out of the 18 industries tracked showed growth. Textile mills and apparel, leather and allied products led industry growth, while furniture and related products were the only laggards. Looking at the individual components, the new-orders index rose +4.7 points to 65.1, while the production index added +1.5 point to 62.9. As with the PMI reports, ISM reports use a scale in which readings above 50 indicate expansion. GDP remained at 1.9% in the fourth quarter of last year—weighed down by a larger trade deficit that offset a surge in consumer-spending. Data from the Commerce Department showed that consumer spending increased +3% in the fourth quarter, 0.5% more than initially reported. Yet the increase was offset by smaller increases in business investment and state and local government spending. As a result GDP was unchanged from its original estimate. In the details of the report, a large portion of the upward revision was due to higher spending on new cars and trucks, which bode well for the economy. Automobile sales typically improve as the economy strengthens. However, the bulk of the increase was due to spending on health care. The rising cost of health care coverage continues to eat into the budgets of U.S. households. The higher cost of gasoline and other products pushed the level of inflation to its highest level since 2012. The Federal Reserve’s preferred inflation measure, known as the Personal Consumption Expenditures (PCE) price index jumped +0.4% in January. The index is up +1.9% over the last 12 months, matching its highest year-over-year level since October 2012. The rate of inflation is now close to the Fed’s 2% long-term target. A move higher could push the central bank to raise interest rates more aggressively. The rise in inflation over the last year has been mostly correlated with the increase in the cost of oil; however other staples such as healthcare and the cost of rents have also increased. The Core PCE index that strips out the cost of food and energy has been more stable. That index was up +0.3% in January, and has remained between 1.6% and 1.7% over the last 13 months. In Germany, a new report has shown the poverty rate is breaking new records in Germany, even as GDP continues to grow. Several of Germany’s major charities have called for a “rigorous change of course” in the government’s tax and finance policies to fight growing poverty. The poverty rate reached a new record level of 15.7% in 2015, according to a report entitled “Human dignity is a human right” by an alliance of organizations called the Paritatische Gesamtverband. While the charities are calling for better redistribution of wealth, some economists say factors like immigration are likely playing a large role. In Japan, factory output unexpectedly fell -0.8% in January, its first decline in 6 months and the latest in a series of economic concerns for the world’s number three economy. The figure missed economists’ expectations of a +0.4% expansion and came a week after Japan registered its first trade deficit in almost six months. Taro Saito, director of economic research at the NLI Research Institute said, “This is a reminder to be cautious for those who have been upbeat on Japan’s economy.” Although production of electronics expanded the first month of the year, it was offset by a decline in vehicle production. Finally, here’s a cautionary tale that should remind us that “nothing is forever”. Everyone knows that one of the original smartphone pioneers was Blackberry. 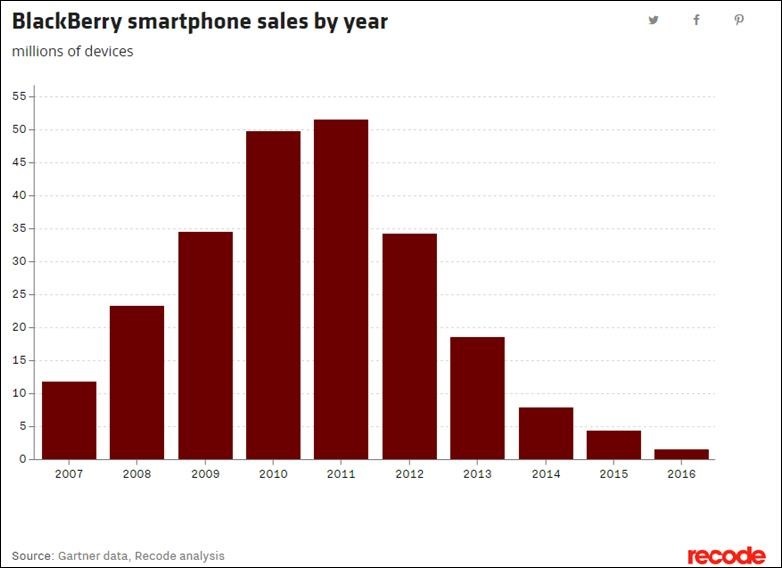 In fact, for some time, it was the dominant smartphone. Back in 2011, Blackberry’s handset sales peaked at over 52 million units. But as iPhone and Android sales gained ground, Blackberry’s share of the market slid precipitously. The reasons are myriad, but in short Blackberry devices were surpassed by the hardware and most importantly the apps and software available for the Apple iPhone and Google Android devices. Despite numerous attempts featuring new hardware and software, Blackberry has never been able to regain even a shadow of its former glory. In the final quarter of last year, Blackberry hit a terrible milestone by recording a 0.0% (rounded) market share of the smartphone market, according to research firm Gartner. The chart below, from Gartner and tech research firm Recode, illustrates the steep decline to effectively zero.